The Minot State University Veterans Center, along with Fortis Energy Services and area partners, sponsored the second annual Veterans Employer Summit Monday, Nov. 6, at the MSU Student Center. The summit kicked off a weeklong Veterans Celebration at Minot State University. Lt. Gov. Brent Sanford gave the keynote address. Sanford, a native of Watford City, N.D., was elected North Dakota’s 38th lieutenant governor on in 2016. He is a third-generation business owner and served as the mayor of his hometown of Watford City from 2010 to 2016 and as a city councilman for four years before being elected mayor. Minot State University announced the implementation of a newly created four-year renewable award beginning in the fall of 2018. This award program is designed to attract new students who have demonstrated academic excellence in high school and to support their attainment of a degree from Minot State University. Awards will be disbursed each semester if the student maintains a high level of academic performance while enrolled at MSU. For more information about this new merit-based financial assistance program or to schedule a tour, call 858-3350 or visit http://www.minotstateu.edu/enroll/scholarships.shtml. The Minot State University Program of Broadcasting will host its 19th annual KMSU Auction Thursday, Nov. 30. The auction will stream live on Channel 19 and the YouTube Channel at 6:30 p.m., with a preshow starting at 5 p.m. Viewers will have an opportunity to bid on items by calling in, and the highest bidder will get the package. The KMSU Auction fundraises for scholarships and equipment for the MSU broadcasting program, with 10 percent given to charitable causes. This year, that portion will be given to the Magic City Discovery Center. The Minot State University Science Division and the MSU Beta Gamma Phi Science Club hosted a Solar Eclipse Viewing Event on Aug. 21. The eclipse started at 11:33 a.m., reached its max at 12:51 p.m., and then ended at 2:12 p.m. in Minot, where approxiamtely 79.6 percents of the sun was eclipsed. In addition, the club showed a live stream from NASA of the total eclipse. In its 11th year, NOTSTOCK urged Minot and surrounding communities to “come create art with us!” Minot State University sponsored its annual art festival, NOTSTOCK, Oct. 4-7 at various locations on the MSU campus. Students, faculty and staff, along with high school and junior high students from around the region, got their hands dirty throwing on a potter’s wheel; screen printed a T-shirt; shared a poem at the poetry slam; attempted a tongue twister; took to the stage; or got behind the camera. This year’s printmakers were Ryan Duggan and Elizabeth Kovach of Chicago. Kovach is a screen printer, and her husband, Duggan, is an artist and printer, who, for the last 11 years, has made concert posters and art prints under the name Drug Factory Press while also making “fine” art under his given name. Minot State University’s Deaf Education Program celebrated its 55th anniversary with events during Homecoming 2017. “Celebrating Centuries in Deaf Education: Honor the Past – Inspire the Future” included guest lectures, a symposium, and a reunion. Dr. I. King Jordan gave a community presentation in Aleshire Theater. MSU also sponsored a Deaf/Hard of Hearing Education Symposium. Dr. Karen L. Anderson was the keynote speaker. While Minot State is celebrating 55 years, deaf education in the United States marked its 200th birthday in 2017. On Sept. 15, Sodexo Food Services and Minot State University dedicated a POW/MIA table display that will reside in the campus dinning facility. The dedication included representatives from Sodexo, MSU, and the Minot Air Force Base. The event, co-sponsored by the Minot State University League of Social Science, featured 11 MSU students and political science professor Jynette Larshus. According to the MSU league’s president, Michaela Brost, the student-run event gave attendees hands-on experience. The Minot State University Native American Cultural Center and Club, along with the MSU Diversity Council, began a month-long Native American Cultural Celebration Nov. 1. Events range from guest speakers to discussion and panels. On Nov. 1, Don Bartlette, a public speaker who previously attended MSU and author of “Macaroni at Midnight,” spoke about growing up with disabilities and abuse. The remaining schedule features Melissa Olson, co-writer and co-producer of the audio documentary “Stolen Childhoods,” on Nov. 20 at 10 a.m., and a discussion panel on Native American-Indigenous people on Nov. 27 at 2 p.m. Both events are in the Conference Center, third floor, Student Center. On Nov. 30, Alex DeCoteau will present his thesis, “We are not trying to save the language. The language is trying to save us.” DeCoteau will present at 3 and 7 p.m. in the Multicultural Center. The Minot State University Student Social Work Organization, MSU Title IX/Keep U Safe program, and the Domestic Violence Crisis Center teamed up to sponsor the annual Take Back the Night event Oct. 19 at the Beaver Dam in the Student Center. Lea Ana Kelley, a survivor of multiple forms of abuse, was the guest speaker; Dominica Granada, a member of the MSU Criminal Justice Club, discussed the main points of Marsy’s Law; and Lexi Wyman provided music. The MSU Theatre Program opened its first show of the season in the Aleshire Theater Oct. 19. "God of Carnage" is an award-winning comedy by Yasmina Reza that centers on the meeting of two sets of parents attempting to resolve a dispute between their young sons. Aili Davidson Smith directed the play. “Dinner Theatre” ran Nov. 2-5 in Aleshire Theater. The play, written and directed by Conrad Davidson, included short sketches centering on the theme of food. Minot State’s efforts were supported in two significant areas by the state of North Dakota. First was the North Dakota Tax Credit for Charitable Giving law. This law provides for a 40 percent ND tax credit on qualified charitable contributions of $5,000 or more. The second was the North Dakota Higher Education Challenge Grant, which provided $1 for every $2 of private money raised for approved projects. Minot State was awarded $691,000 during the fiscal year from the Challenge Grant fund. Both initiatives are ongoing and will play a role in giving in 2017-18. Information for both can be found on the Minot State Advancement Office website. MSUWell hosted its annual Wellness Fair Wednesday, Nov. 15, from 11 a.m. to 1 p.m. in the Student Center Atrium. Students, faculty, and staff visited with MSU community and Minot community experts to help meet wellness needs. MSUWell also kicked off its annual Healthy Holiday Challenge. Participants weighed-in, received instructions on how to do at-home exercises, and received their first newsletter. New/used men’s winter gloves, hats. New/used movies on DVD or Blu-ray. Nonperishable snacks: granola bars, fruit snacks, pudding, applesauce, trail mix, fruit bars. Microwavable food: soup, stew, chili, ramen, pasta, rice, etc. 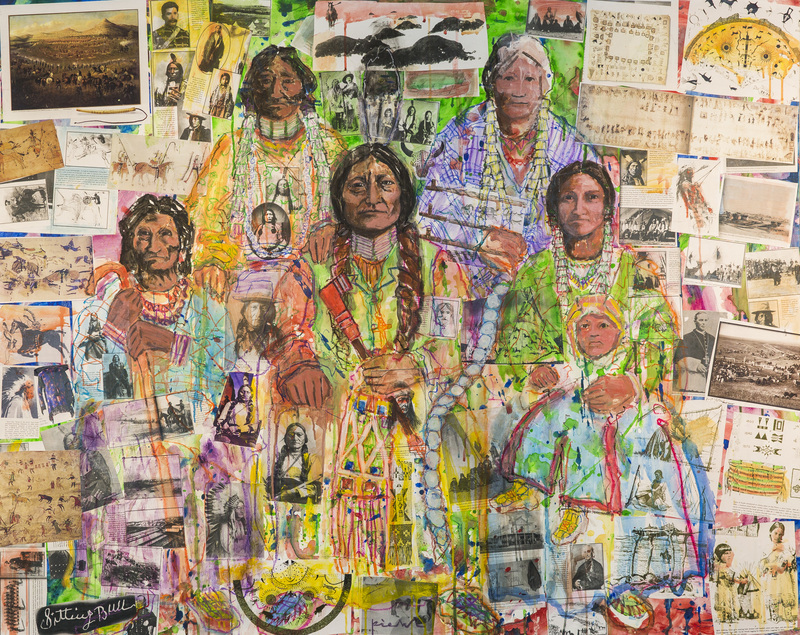 Nov. 14-28 — "In Our Own Words: Native Impressions," prints by Daniel Heyman, Hartnett Hall Gallery. Nov. 14-28 — "Children's Stories from Around the World," handmade books by MSU senior art student Maroah Foster, Gordon B. Olson Library Gallery. The Minot State University Staff Senate gave High Five awards to Charlie Radke, custodial staff, in August; Julie Keller, CETL administrative assistant, in September; and to Amanda Francis, publication and design, in October. Congratulations to Beth Marschner, MSU athletic training, for winning a Minot Area Chamber of Commerce Eagle Award. MSU’s CETL selected Emily Miller as Student of the Month in August. Lynae Holmen, special education adjunct instructor, was named Minot Public Schools 2017-18 Teacher of the Year. Holmen has taught deaf/hard of hearing students and students with learning disabilities in Minot for nearly 30 years. She teaches graduate deaf education courses for MSU. Stewart Kelly, professor of philosophy, completed a book titled “Understanding Postmodernism: A Christian Perspective.” InterVarsity Press Academic will publish it in December. He also had two entries, titled "theories of truth" and "postmodernism," published earlier this year in the Zondervan Dictionary of Christianity and Science. Robert Kibler's (writing and literature) article, “Presumed Dimensions and Their Spiritual Character in Ezra Pound's Asian Sources, Early Theories, and Later Cantos," appears in volume iv, Numbers 1 and 2 of Make It New, the Ezra Pound Society magazine. To request a copy, contact Kibler at Robert.kibler@minotstateu.edu or call 858-3876. A collection of eight expressionist pieces by Walter Piehl, art professor, is currently showing at the Lewis & Clark Interpretive Center in Washburn. The pieces were commissioned by the Lewis & Clark Fort Mandan Foundation, working in collaboration with the Northern Plains Heritage Foundation. The paintings are on display through December before traveling to other venues in the region. Click here to view one of Piehl's paintings on display.